This post is part 4 of 4 of a suggested itinerary through Northern Yucatan, Mexico. If you missed it, be sure to read the Overview (part 1), Days 1-2 (part 2), and Days 3-5 (part 3) first. Playa del Carmen is a touristy town on the Mayan Riviera. The main appeal Playa del Carmen is its beach and the bustling Quinta Avenue (Fifth Avenue) – a pedestrian only street that features a variety of restaurants, bars, clubs, and kitschy souvenir shops (featuring products made in China). To us, Playa del Carmen felt un-authentic, and we didn’t spend much time there. Rather we used the town as a base from which to branch out to nearby areas. 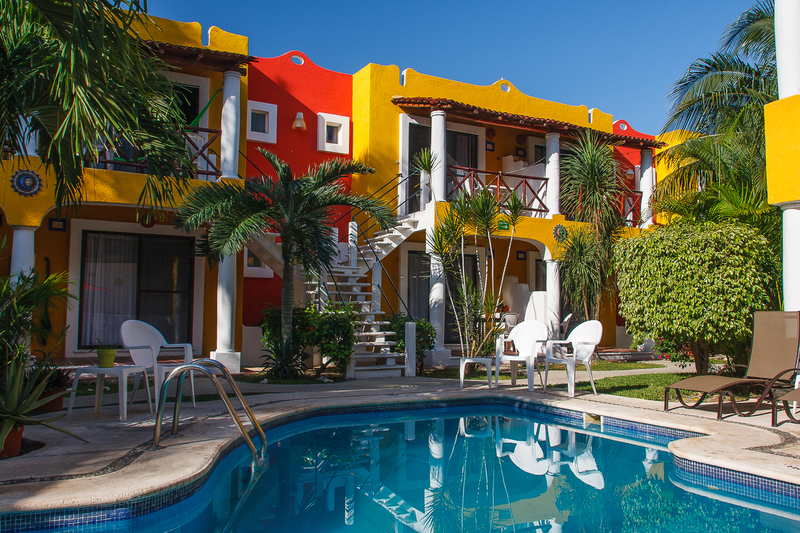 In Playa del Carmen we stayed at the El Acuario Hotel, a quaint and colorful place located 4 blocks from Quinta Avenue and the beach. The rooms were basic but clean. All rooms face an inner courtyard which features a pool and a garden area (complete with grill and places to relax). We stayed at the hotel only a couple of days, but others had taken up short term residence there. The vibe around the courtyard was very communal and relaxed. It’s not uncommon to return to the hotel after a day of exploration to be welcomed by residents relaxing in hammocks from their balconies. Hotel El Acuario – Playa del Carmen. If you’re looking for a charming hotel in the middle of Playa, check out Hotel Lunata on Avenida Quinta. The decor is attractive and it’s located just off the beach with access to all the activity that Playa has to offer. Be aware, however, that light sleepers may wish to have a room facing the courtyard, as late night activity from Avenida Quinta may be bothersome. Hotel Lunata is a little more expensive than further off budget hotels, but in this case you’re paying for location. Xel-Ha is an all-inclusive aquarium park that features snorkeling, scuba diving, zip lining, biking, tubing, and other diverse nature and water-related activities. All of the activities are performed around a crystal clear tropical lagoon filled with a variety of fish and rays. Basically if you think of Xel-Ha as a mild Disney-esque experience in a nature park, you’ve got the right idea. Xel-Ha is located 47km (29 mi) south of Playa del Carmen and is easily accessible by bus (around $6/person) from the bus station on the corner of Avenida Quinta and Avenido Benito Juárez, across from the Parque Fundadores. Admission to Xel-Ha is around $89 per adult ($80 if you purchase online), which not super cheap and may eliminate it from budget travelers’ agenda. The price is all-inclusive, however, and includes snorkel gear rental, bikes, and all-you-can-eat buffets at several fine park restaurants. For us, Xel-Ha was a relaxing splurge day after several days of running and exploration. 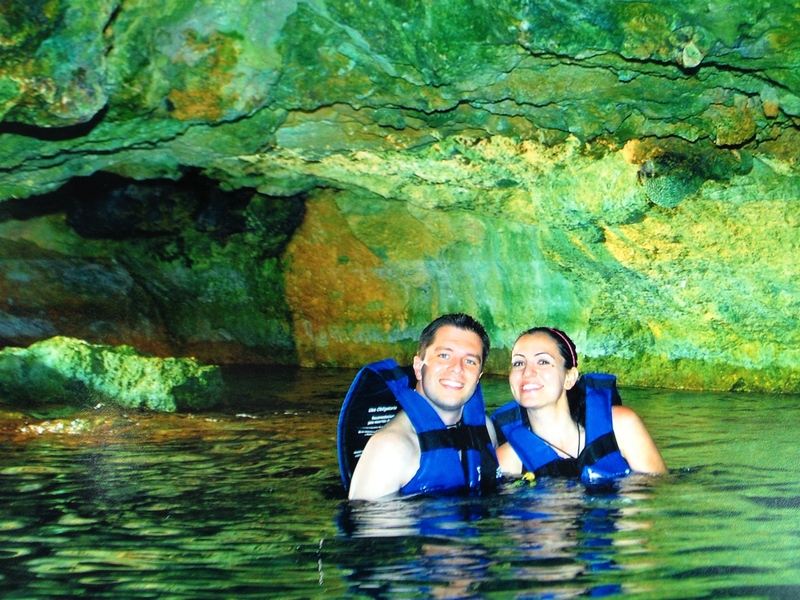 Swimming through a grotto at Xel-ha. Xel-Ha is a heavily advertised tourist attraction targeted more towards families and nearby resort patrons, so the adventure traveler in me felt a bit dirty for even considering a visit. Once I was there, however, I put that out of mind and had a blast with Zena. 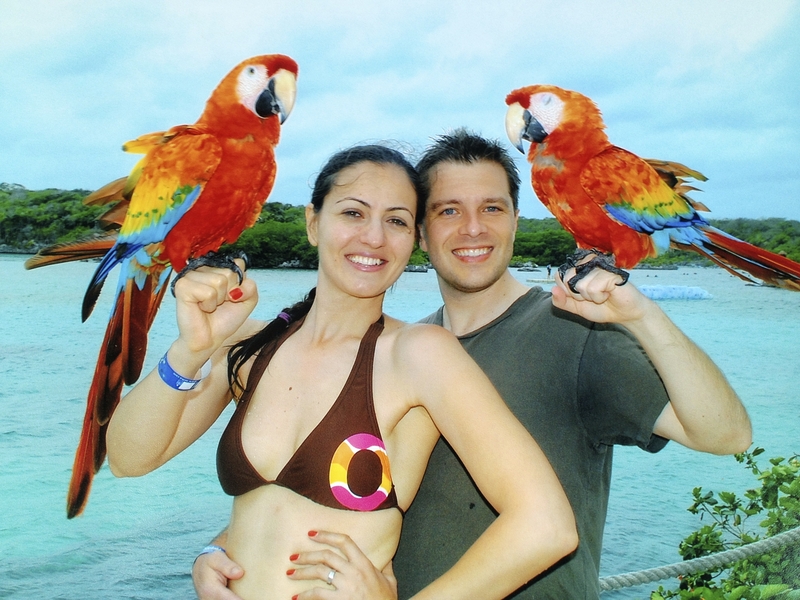 The park is very large and it takes all day to experience everything that Xel-Ha has to offer. We spent hours snorkling in the lagoon – an experience that is much more comfortable than in the open sea where waves and currents pull you around. Taking a 30-minute break after eating so we don’t drown. At one point we each accidentally dropped snorkel gear, which promptly sunk to the bottom of the lagoon. I was prepared to pay out a $25 fee for each non-returnable item, but after a few deep breaths and several deep dives, I managed to retrieve the gear. 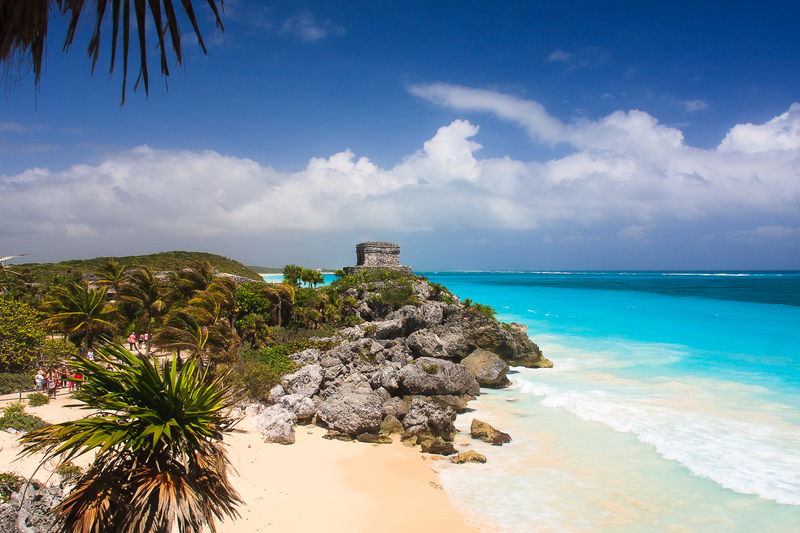 Tulum is known for its Mayan fortress-city situated on a cliff high above a beautiful white beach. 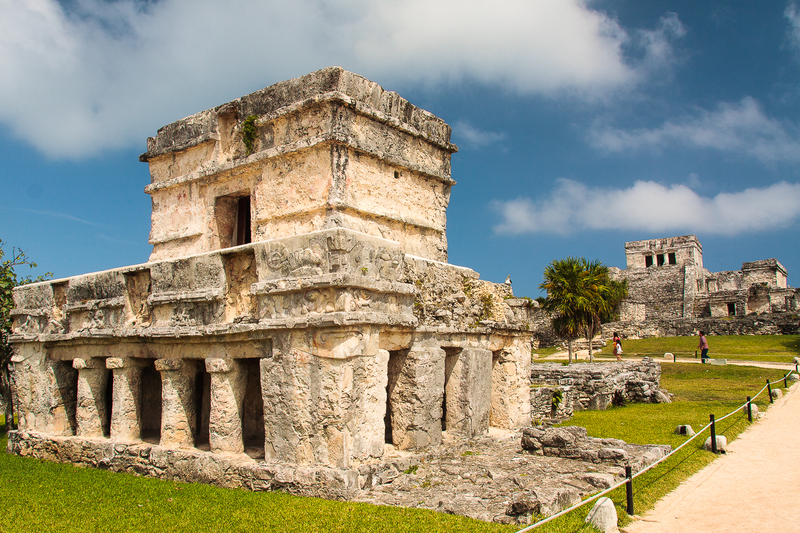 Tulum was one of the last cities inhabited by the Mayas, and is one of the best preserved Maya coastal sites. The ruins aren’t very expansive, but they are impressive. The Temple of the Frescos with El Castillo in the background. Round trip bus tickets from Playa del Carmen cost around $6 and the trip takes about 1 hour and 20 minutes. It’s best to go early in the morning before the weather gets too hot and before the tourist crowds get too thick. The Temple of the Winds stands vigil over a sea turtle nesting ground. While you can easily spend an hour or so touring the ruins, it’s worth planning ahead and bringing a swimsuit, towel, and some sunscreen. The beach behind the ruins is amazing! Spend an hour touring the archaeological site and then move on to the warm, turquoise water of the Caribbean. 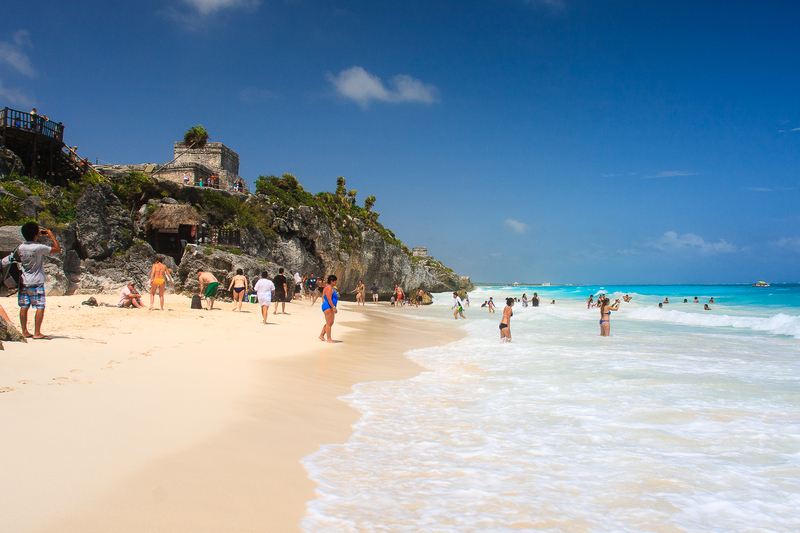 The beach is accessible via steps behind Tulum’s most impressive stone structure, the Castillo. The ruins of Tulum loom over the white sand and turquoise water of the beach below. A portion of the beach at Tulum between the Temple of the Wind and the Temple of the Descending God is protected for nesting sea turtles and is inaccessible to the public. Even after seven packed days throughout the Yucatan, there’s much more to see and do. For those without additional exploration days, however, the airport in Cancun is only an hour north via the bus ($11 one way). For those considering a trip to the Yucatan, we suggest you stop considering and just go. You’ll fall in love with the people, the culture, the food, and the sights. If you’ve experienced the Yucatan and have additional suggestions or recommended things to do, sound off in the comments below. Planning a Trip to the Yucatan? Ready to fly to Cancun? Check out cheap flights here. Looking for a place to stay? We recommend Hotel Zaci in Valladolid, Hotel Julamis in Merida, and El Acuario Hotel in Playa del Carmen. Planning your trip? Pick up the Lonely Planet guidebook for Cancun, Cozumel and the Yucatan. Loved your blog as it puts ‘meat’ on all our readings and descriptions of the Yucatan we’ve done. Beautiful photos, descriptive, condensed and informative. We are off to the Yucatan in Feb’2016 for 2.5 weeks. Glad you’ve enjoyed it. Have a great time in the Yucatan. I’m thinking it’s time for us to return, as well. Very very very helpful blog. I am planning my trip using all this info. But I will be skipping XelHa and Akumal. Looking forward to the trip! I meant Uxmal (not Akumal). Also planning to spend a night in Tulum instead of 2 in PDC. Have a great time! It’s a beautiful time to be in Mexico. Absolutely lovely and super helpful guide for our upcoming trip to Cancun and the Yukatan! Incredibly inspired by this post, thank you so much. Glad this is helpful. Enjoy your trip! Do you think your itinerary would work with children? (ages 13 and 10?). Is renting a car a good or bad idea versus public transport? Rhonda, I think your kids would have a blast. The only day in which they may get bored might be exploring/shopping Merida downtown. There are other fun things that kids might enjoy around Merida, however, so be sure to look into those. As for renting a car, we haven’t tried it since bus transportation is cheap and efficient. If you’re good with maps or have a reliable GPS, I can see where renting a car would allow greater freedom and flexibility. Good itinerary. I am leaving to Cancun in five days and not much time to prepare, so I) am using your information. Thank you! Adriana, have a great trip! This sounds amazing! I studied Spanish in college, but never made it to any Latin American countries. My sister wants to travel for her 40th birthday this winter and I’m suggesting we follow your itinerary. We’re more interested in history and culture than the really touristy attractions, so I’m so glad I found your itinerary! So…while traveling between cities, what did you do with your bags when you’d stop to explore a sight along the way? Are there amenities to lock your things? Did you check in at your lodging first? Or do you just not have much with you because it’s warm? Kimberly, I’m sure you and your sister will have a great time. As for the bags, we would check them at our hotels as soon as we arrived at our destinations. For the half-day trips (Ek Balam or Uxmal), we kept our bags in the hotel until it was time to leave later in the day. For the full-day trips (Chichen Itza, exploring around Merida, Xel-ha, and Tulum), we left our bags at the hotel and carried day packs with whatever we needed for that day. Just a few steps away from the bus stop in Tulum is a small shopping area with some restaurants and souvenir stalls. The Danza de los Voladores is in that area. You may need to inquire as to the times of the shows. We caught the show in the late afternoon as we were leaving the Tulum ruins. Thank you so much for the information, David! We really appreciate it! Absolutely. Enjoy your time in the Yucatan! Planning a week trip around end of the year with a stop in Mexico City first. Would you recommend public transit over renting a car? Is renting a car too much of a hassle? Steve, from a driving perspective, we once rented a car in San Diego and then crossed the border into Mexico and had no trouble getting around. However we’ve never rented a car in Mexico, so I can’t speak to the difficulty of the process. We’ve never been to Mexico City, but in Guadalajara (the second largest city in Mexico), we would often Uber since it’s easy, convenient, and affordable.